Backing up your systems and the data contained within it should be a task your business does on a regular basis. However, when it actually comes to backing up your systems, you have a number of options available to you, and it can be tricky picking which one to go with. From tape to cloud, you should be aware of the main options and what they offer. Some businesses use all three, while others stick to using just one. While each of these options do the same thing – essentially backing up your data – there are differences between each platform. Tape-based backup is the oldest forms of data backup available to businesses, and has been in use since the mid 1960s. Many older, or well established businesses, likely have used this method for a long time, so they may find it easier to stick with it, largely because no infrastructure upgrades are needed. While this method may seem a little anachronistic, there are still manufacturers creating backup tapes – most notable Sony, who recently introduced a new tape system that can store up to 185TB (terabytes) of data on one tape. That’s about equal to the storage capacity of around 11,800 16GB iPhone 5s. The vast majority of businesses using this system do so as a secondary backup. They use another system to back up their data, and then back up this backup data onto physical tape which can then be moved off-site and stored in a safe location, should disaster strike. The biggest drawback of tape stem from the fact that it is an older method and it takes longer to back up data compared to other systems. The tapes themselves are also more fragile and can be prone to failure, leading to corrupt data and unreadability. Finally, if you do need to recover from a tape backup, you are going to have to do so in a specific manner, which means it will take longer to recover your systems than other methods. Disk-based backup solutions use a variety of disk storage units to hold backups of your data. The most popular forms of disk storage used are hard drives or optical disks. Because these systems use more modern storage methods, backup and recovery can generally be carried out far quicker than with tape systems, and can be more reliable, especially if you take care of your systems and the disks the backups are stored on. The added benefit with these systems is that hard disks are constantly dropping in price and increasing in capacity, meaning you can fit more data on fewer devices. This helps keep costs manageable, and may result in reduced costs over time. Because disk-based systems rely on hard drives or optical disks, there is always the chance that your backups can be lost, ruined or even stolen. Also, many companies choose to keep these physical backups on-site, so if there is a disaster this could result in the loss of these backups. To get around this, many companies have duplicate systems. They back up to different devices which are kept off-site. This redundancy can help ensure that your data is available, but it can be expensive to purchase multiple backup solutions. 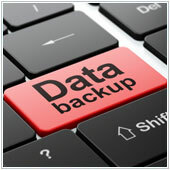 Cloud, or online-based backup, utilizes off-site technology to host your backups. Most small business solutions work with providers who host the servers in their organization. The business then connects to the servers via a network connection in order to backup their data. The biggest advantage of cloud systems is that they are generally more affordable. This is because you don’t need to have the systems in your office, which means you don’t need to pay for the data systems and the upkeep associated with them. Cloud systems are also less labor intensive because they can be managed by your IT partner. Aside from being easier to manage, backup and recovery is usually quicker with the cloud because you can set up a solution that continually backs up. As long as you have an Internet connection, you will usually be able to restore your systems in a matter of hours. While the cloud is becoming the most popular backup solution, there are some drawbacks. You need a faster bandwidth connection if you want to be able to back up while also working. This may require you to invest in better network infrastructure, which costs. The other issue some companies have is that because this is a new solution, they may not trust that the solution is secure. The vast majority of backup solutions available have been designed to be secure and have become a viable solution for many smaller businesses. If you are looking to implement a backup solution in your business, contact us today to learn about what solutions we have to offer.